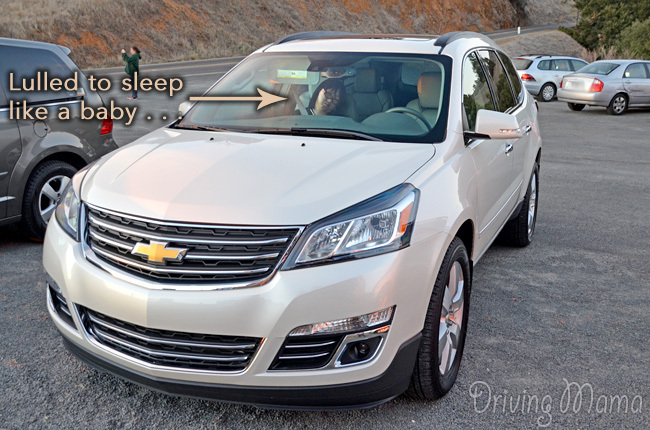 Is the 2014 Chevrolet / Chevy Traverse the Right SUV for Your Family? 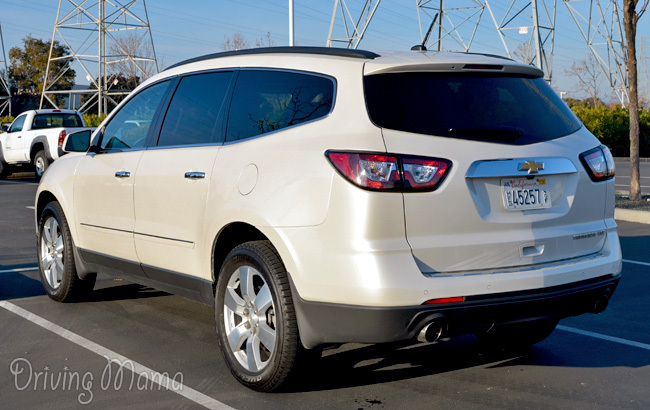 In the world of crossover SUVs, the 2014 Chevrolet Traverse leans toward the larger end of the scale while still keeping style intact. A good friend of ours has an older model of the Traverse. The husband loves it, the wife can’t wait to replace it. Why the stark contrast? This sport utility vehicle (SUV) offers the option of having 7- or 8-passenger seating. In the 7-passenger model, two full-grown adults can sit comfortably without the need to ‘squish’ another person in the middle. It’s also great for cutting down on the “Mom, they’re touching me again!” complaint. There’s also the issue with control layout. The middle area is fine with most controls easy to understand and access. However, there’s one set of buttons that just don’t belong. Despite the distance and placement, these are actually for the small screen in the dashboard. The options are confusing and it’s awkward to scroll through the selection. In fact, the first time I was checking this out, I accidentally changed the display language to French! Thank goodness the option to go back to English periodically popped up. But, it also shows just how easily and often such a mistake can be made. The second row is easily the favorite place to be. With a separate climate control, a/v inputs, a USB port, and a three-prong 120v outlet there’s not an electronic that can’t be recharged here. When my daughter forgot the car adaptor for her Nintendo 3DS and only brought the regular one, this was one feature she really appreciated on our mini-road trip. To get to the third row, passengers can either go between the middle row seats or slide them up. The area between the middle row seats is fairly narrow due to the arm rests. But, if you want to slide the seats up, quite a bit of strength is needed. Once the lever is moved, you really have to force the seat forward with your back leveraged against the door frame. At least the seat slides back easy enough. Seating in the last row can be a bit tight and I wouldn’t recommend putting long-legged people there. The lower vents protrude and lessen foot space considerably. When we were driving around a couple of my daughter’s buddies, it worked out best to have two girls in the second row and one in the middle seat of the third row. They all had enough room to feel comfortable and each still had a prime view of the movie we had playing in the car. Oh, and by the way, the screen did not obstruct my view of the road in the rear view mirror. While the ride can be bouncy and handling is difficult in the city, the Traverse really shines on the highway. It’s like a whole other car at higher speeds and for long distances. All of us were perfectly comfortable on extended drives and the Traverse just purred while in cruising mode. See how it affected me on the trip home? When the third row of seats is upright, there’s sufficient space for a small grocery trip. 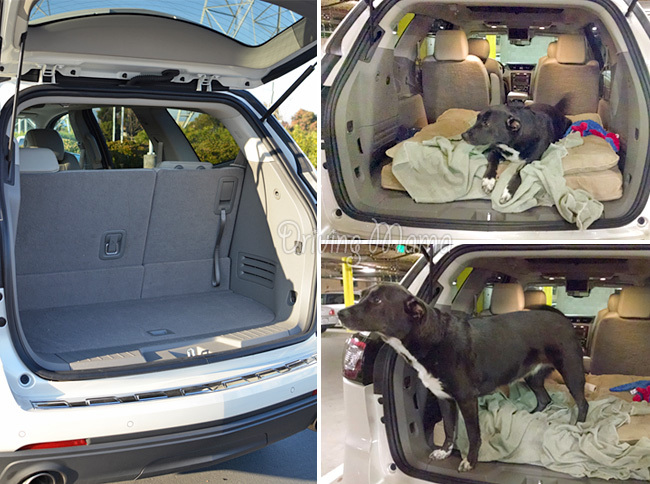 However, putting down the third row make for plenty of room if you need it to be pet-friendly. Speckles loved lounging on her 3’x 4′ bed while we were driving around. We did have to place a bag between the gap of the middle seats so she wasn’t running free around the car. The dimensions of the Traverse are comparable to other vehicles of its class but feels overly bulky when driving. So, while the engine specs might appeal to ‘him’, the size may be overwhelming for ‘her’ (the one most likely driving it). You’ll also have to choose to have more people or to have your dog ride with you as you probably won’t be able to fit both. For those that really want an American-made car, I can see how the Chevrolet Traverse might appeal to them as it is just that. It performs well over long distances and on the highway. Around town, though, the powerful engine (3.6L V6) didn’t seem to distribute the functionality as nicely. Also, extra options are fairly costly and can easily bring the price up to a good $45K to $50k. In that range, the Traverse sets itself up against a more luxurious class of rivaling SUVS (such as the Acura MDX). For more reviews & car-related tips, visit my automotive site for women & families, DrivingMamas.com. Basic Car Maintenance: How Often Should I Get An Oil Change? I got to test drive a Chevy Traverse last year and I LOVED it!! Such a nice SUV. That does seem just a bit big for me. I drive a CR-V currently (one of the earlier models as it’s 15 years old already). I like the functionality of a mini SUV but I don’t need the space of a 7 person vehicle. I do often wish for something that I could transport say bulky items from IKEA home with me, but I guess to buy a whole vehicle for that purpose would be silly! LOL. It looks roomy. If our van doesn’t get road worthy, we want to buy another vehicle. This looks roomy but we are not partial to Chevy, unfortunately. We are more Ford people, but shhhh…..
We’re getting a new car in two weeks and this is actually on our short list. The roominess alone is worth it! I LOVE the look of the Traverse. I’m partial to GM because I love OnStar. That’s a great space in the back for your dog. My two fur babies would love to have all that space when traveling. I really need a larger car this looks like it might have enough room for us. I love how roomy this vehicle is. It is hard finding an SUV that has three row seating and enough room for our family. We bought a smaller SUV and I love it but sometimes miss the a bigger one. That IS pretty costly, but it does look nice! I am dreaming of an SUV now that we have two car seats in our tiny sedans. That is such a nice looking car. I love all the room it has while still being a little sporty. It sounds like it’s definitely great for traveling, and then maybe use the other car for commutes to work. It’s cute too! I’d def. test drive it when car shopping ( I love the long distance comfort factor and the ample seating) but I’d be sure to try those seats (moving them) while I was…the seats have to move easy or it’s not really a convenience to have that feature. It’s got a great visual appeal for me, I love the way it looks. Your review of it is awesome! I love that you broke it down into the real pros/cons. I’m willing to bet anything that when it’s time for me to get a new car, my husband will suggest this one. He LOVES Chevy. When we are ready to trade in our current SUV, I’ll look at the Travere for sure. Looks like an amazing car. Great review. I never knew a Chevy could be so snazzy. Oh now this is something that would work for our family. Love the traverse. This article just saved my sanity. I have a Traverse as a rental, and all the displays were in French. Not a big deal, but it was driving me crazy. Just looked through a bunch of content to find how to put it back to English. Thanks!